If you’re sitting at the bar talking to a group of saxophone designers, before long the topic is sure to turn to the neck, and it will be universally agreed that the neck is the most misunderstood and critical component in determining the saxophones sound and intonation. There’s more mythology and misunderstanding about what goes on inside the neck than on any other part of the horn, and hopefully by the end of this article you will have a bit more understanding of the theory and science involved in necks, and you will be able to make much more informed choices as to the proper neck which maximizes the potential of your horn. Of course, the function of the neck is far more than to provide a link between the mouthpiece and the body of the horn. The neck shapes the sound and sets the intonation, and significantly influences all the playing characteristics of the horn. An improper neck has impeded the performance of many a saxophone, and a horn that is not playing its best can very often be significantly improved through the fitting of a different neck. The saxophone is a series of four cones (neck, body tube, bow, and bell), each with a unique and different taper, and the neck is far and away the most crucial. I believe it is appropriate to begin our discussion of necks with an overview of the various processes used in their manufacture. A potential saxophone buyer should always inform themselves as to the methods used in the construction of an instrument being considered for purchase, as the method of manufacture to a large degree determine the ultimate performance potential of the horn. Most necks used on inexpensive instruments are manufactured through a process known as hydroforming. After a cone of the approximate thickness and taper is formed by braising (or preferably plasma welding) a triangle of metal, the end is temporarily sealed and a liquid (usually iced water) is introduced under extremely high pressure to force the cone against the walls of a mold in order to produce the desired shape. This method is quick and inexpensive , but tends to “work harden” the metal, making it brittle and less resonant. A much preferred method of manufacture, but of course far more expensive, is to form the neck cone over a mandrel by burnishing. This requires the services of a highly skilled and experienced master craftsman, but the difference in response is dramatic due to the lack of work hardening. Regardless of the method used to form the taper, the neck must be bent to achieve its final shape. This is accomplished by filling the tube with either pitch or melted lead (both of which are easily completely removed by heat) to support the interior and prevent kinking while the neck is bent over a form to achieve its final shape. The tenon, braces, pip, and other fittings and accoutrements are then soft soldered into place prior to final engraving, lacquering, or plating. Since the true acoustic function of the neck to shape the sound, the taper is the most crucial factor in its design. In order to produce a neck which gives good intonation and response, careful attention must be paid to the points within the neck where the nodes of the wave strike. A chart showing the approximate location of these points for alto and tenor saxophones is below: ￼ ￼ Knowing the location of the nodal points is invaluable information for the saxophone designer or repair technician. Through changes in the neck taper, a given pitch can be raised or lowered. 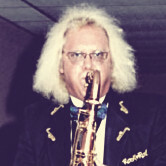 A skilled technician can adjust the intonation of a specific range of the saxophone by expanding or shrinking the neck, but it should be noted that although acoustical success can be achieved, the results are often cosmetically unappealing, leaving a neck that plays well but has a “stair case” appearance. Additional mass may be added at specific nodal points in order to alter the response characteristics (but not the pitch) of a given note, or may be used to dampen certain harmonics. Care should always be taken in the location of various braces and mechanisms so that unintended dampening does not occour. Substantial anecdotal evidence indicates that the performance of the saxophone, particularly with regard to the response of the very lowest tones, can be improved through “rifling” the initial two inches of the neck with a somewhat coarse thread. This procedure appears to significantly to reduce the “motorboating” and burbling which often plagues saxophones around low C and low B. All saxophone necks have a ring soldered on the mouthpiece end to prevent splitting of the seam due to the stress of installing the mouthpiece repeatedly. Anecdotal evidence seems to indicate that benefit can be derived from increasing the mass and shape of this ring (tapering it to form a venturi), giving improved response time. Over the years, a number of variations have been tried on the system of attaching the neck to the body. Virtually all modern saxophones use a “male” tenon which is inserted into a “female” receiver on the body tube. This system works quite well. In years past, some manufacturers, notably Conn and King, have offered a system in which the “male” tenon was a part of the body tube and the “female” receiver was a part of the neck, surrounded by a skirt alleged to make the joint “leak proof”. Unfortunately, this design was far from leak proof and offered no real advantage in that regard. It proved almost impossible to adjust for the metal compression and loss of perfect roundness which invariably result from repeated saxophone assembly, and fell from favor. There have also been a few attempts to resolve the issue of the tenon being straight through the introduction of a tapered tenon. Unfortunately, the tapered tenon is almost impossible to adjust, although in theory it does possess acoustic merit. The variations in octave key mechanism have been numerous over the years, with the majority of makers selecting a ring at the base of the tenon to contact the vertical shaft of the octave mechanism located on the body tube. This mechanism has the distinct disadvantage of being quite easily damaged during horn assembly, and also tends to limit the number options available to player for placement of the neck. By necessity, the portion of the mechanism which extends from the contact ring up to the key itself is located almost exactly where most players place their hands when inserting the neck into the body tube. This has resulted in a bent mechanism and leaking octave key at one time or another for almost all saxophonists. A far better solution is to use an “underslung” mechanism such as was favored on the Buescher 400, the Conn 6m, the King Super 20, and more recently on the Yanigasawa instruments. This system allows the player to grip the neck by the tube without risking bending the mechanism. Needless to say, the material from which the tube of the neck is constructed will have a very significant impact on the ultimate sound produced. Conventional brass necks vary in the brightness of their tone as a direct function of the alloy of brass used. A brass alloy with a higher ratio of zinc in the alloy will usually sound significantly brighter. A “rose brass” neck (significantly higher copper content) will sound darker, and a pure copper neck will sound darker still. Solid silver necks are known for their quick response. Several attempts have been made over the years to manufacture wooden necks for saxophones, but these have proved unsatisfactory due to persistent cracking problems. Several manufacturers now offer multiple neck options for their saxophones, and a few include multiple necks with each new instrument. In all probability, the neck which came with your saxophone will give adequate results. (1) Always keep the tenon and receiver clean. Remove any build up of corrosion regularly with #000000 steel wool. Never apply any lubricant or oil to the tenon as this will attract and retain dirt and grit which will cause uneven wear. (2) Keep the interior of your neck scrupulously clean, not only for hygienic reasons, but also to avoid obstruction. A flexible brush is best for this purpose as most swabs simply do not work very well and fail to scrub out stuck particles. Do not attempt to polish the interior of your neck, as a very slight roughness will generate a boundary layer which will reduce blowing resistance. (3) The fit of your neck is critical for best performance. It should not only fit tightly, but it is crucial that it fit evenly. You can easily check the fit by slowly rotating the neck in the receiver 360 degrees and feel for any difference in resistance. If the neck does not rotate absolutely evenly, it definitely leaks. Have the neck rounded by a qualified technician and then lapped into a perfect fit. You can lap your neck into a perfect fit by applying a small amount of oil (which must be removed completely after the procedure) and a tiny bit of abrasive tooth paste. Spread the mixture of oil and toothpaste until you get an ultra thin coat on the tenon and insert it into the receiver and rotate until the resistance is equal all the way around. This will remove any slight imperfections and high spots. A tenon with high spots will always leak. (4) Be certain that your chosen technician has the correct equipment to properly size and adjust your neck. Ask to see the tools that will be used before you allow work to begin.. Any competent shop should have both a “can opener” style roller expander and a collet type neck shrinker with multiple collets. If they don’t have both these critical tools (the shrinker is also used to properly round the tenon) or if they or if they show you a petal type expander, put your neck back in your case and run for the door! Many a neck has been ruined by an incompetent and poorly equipped technician. If they try to convince you that they can’t use a roller expander without creating a bulge in the tenon or leaving marks, they are simply admitting to you that they don’t know how to properly use the tools of the trade. As a final thought, be sure to protect your neck when it is not in use. Most cases have a specific form fitting compartment for the neck, and if your case lacks this feature, get a separate case specifically for your neck or store it in a thickly padded bag. An old sock or a Crown Royal bag is not adequate protection!